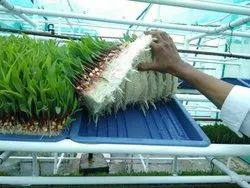 We are instrumental in offering a wide range Nursery Trays, which protects the seedlings and the roots from damages caused by rough handling during cultivation process. Use of these trays also helps in saving water and fertilizers. Our range of trays is available in different sizes, which fits the diverse requirements of the clients. Our team presents FRP Tray for Roof Top Kitchen Garden to the customers from residences and hotels. We work hard to give eye catchy look to the terrace place of the customers. Additionally, we use eye catchy and designer plants for gardening services. 104 cavity tray is used for growing seedlings of tomato, brinjal, chilli, cauliflower, cabbage, capsicum, flower seedlings. Velkan designs, manufactures and markets seedling trays of various cavities & sizes which are grower friendly, stackable and are used for plug propagation in nurseries & green houses. Specification:Holes: 98 hole and 104 holesThickness: 0.3 to 0.8 micronsUsage: Tomato, Capsicum, Watermelon, Muskmelon, Seasonal SeedlingsPlease feel free to contact for further details. Our reputed entity is engaged in supplying Hydroponic Trays.